S7562CZNUANB1 Android 4.1.2 Jelly Bean Firmware Last Updated on 27-Feb-2014. 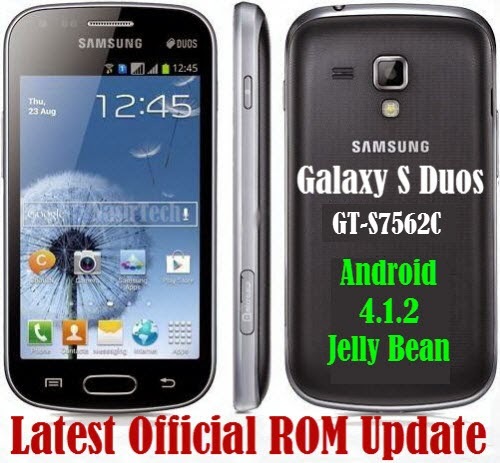 Samsung Galaxy S Duos GT-S7562C (China) recently received the ZNUANB1 Android 4.1.2 Jelly Bean official firmware update. Samsung started rolling out an OTA update about the firmware. The latest firmware build version number is S7562CZNUANB1. The China variant of Galaxy S Duos S7562C is a mid range Android Smartphone by Samsung, released back in the middle of 2012 with Android 4.0.4 ICS (Ice Cream Sandwich) and already get the official Android 4.1.2 Jelly Bean firmware update. Here we have the latest available firmware for the device. If you own the device and not yet updated this latest firmware, then update the same using our simple tutorial below. The below guide will help you to download and install the S7562CZNUANB1 Android 4.1.2 Jelly Bean Firmware manually through Odin. The latest android 4.1.2 Jelly Bean is definitely a great update for the Galaxy S Duos S7562C users as the device has been running on Android 4.0.4 ICS from a long time. The latest S7562CZNUANB1 firmware will upgrade the android version to 4.1.2 Jelly Bean and will bring many new features and performance enhancement. So, want to update your Galaxy S Duos S7562C to the latest ZNUANB1 Android 4.1.2 Jelly Bean firmware? To install in official way, either you can go for OTA (over the air) from Settings-About Phone-Software Update or download firmware through the Samsung Kies utility. However, most of us prefer manual way to update official firmware. So, in this article you’ll find step by step manual guide to update the latest Android 4.1.2 ZNUANB1 firmware on your Galaxy S Duos S7562C through Odin. "The firmware is released only for the Samsung Galaxy S Duos GT-S7562C model, so don’t try this in any other android device. Check your device model number from Settings-About Phone. Also the tutorial is based on Windows PC. Follow all the pre-requisites, procedures and steps carefully to avoid breaking your phone". All the above pre-requisites are very important and must follow before proceed to installation guide. Hope you get all the above points. Now, go through the below tutorial to install Android 4.1.2 S7562CZNUANB1 official firmware on Galaxy S Duos S7562C. Switch off your phone and boot Galaxy S Duos S7562C into Download Mode by pressing and holding the Volume Down+Home+Power buttons (long press until the boot screen appear), now press Volume Up key to proceed to Download Mode. Congrats! you have completed the tutorial to update Android 4.1.2 Jelly Bean official firmware on Galaxy S Duos GT-S7562C. Hope you successfully done the update process. If you followed everything as mentioned in the above tutorial, then your Galaxy S Duos should now running on the latest Android 4.1.2 Jelly Bean build version ZNUANB1. You can confirm the firmware update details from Settings-About Phone. If you stuck in any point or find any issue with the download link, then feel free to contact with us using the comment form below. I have just coming back from Shanghai and just bought this one for my wife. It seems the mobile phine is China Unicom branded. Which meens there are some pre-define china unicom apps in it. The other major issue that i have is that there is not google play parket, google maps .. or whatsoever. Is this because of the branded rom. is there any way to fix that and what is most apropriate one to battle this issue. My main purpose would be to be able to use the google services, but it seems i can't just flash it with some european firmware. Also on some forums i have read the some branded versions would be "bootloader locked", which would mean you would brick the phone if you try to apply unbranded firmware.. however it is not mentioned here. So i am a bit confused what to do. What if i update my Galaxy S Duos to China firmware and my firmware is from Philippines, Can i update my phone to china firmware? or it will make my phone brick? because i'm still confuse about it..reply plzz. if this update frome here make the mobile root or no please reply instantly ?